What does the State of Kansas do when bills must be paid but the bank account is empty? Answer: Borrow. Get a payday loan and promise to repay when more revenue comes in. On July 1, the first day of fiscal year 2016, Kansas took out a payday loan of $840 million. This record-high amount highlights the precariousness of the state’s financial situation. During July, the state needed to pay out hundreds of millions to schools, Medicaid providers, universities, and state employees. (On average the state spends about $600 million per month from the general fund.) Yet Kansas only expected to receive a portion of the amount needed from tax revenue in July. In addition, the bank account (cash reserves) had been depleted to almost nothing as a result of unaffordable income tax cuts, so Kansas had no way to pay its bills in a timely manner without borrowing. In Kansas, the payday loan has a fancy name—Certificate of Indebtedness. The Certificate allows the general fund to temporarily use money from other funds within state government. Bills must be paid from those other funds too, but the timing of the payments varies enough that when the cash from the other funds is pooled, enough is available to allow the general fund to temporarily use or borrow it. This practice is not new. On the positive side, a Certificate allows the general fund enough cash flow to pay bills on time, but the FY 2016 amount is unprecedented. The more difficult the state’s financial position, the larger the Certificate. Previously the highest amount borrowed came during the Great Recession in FY 2009 when almost all states were experiencing significant financial stress. After that, the Certificate amount gradually decreased as the state started to recover financially. However, in FY 2013 the income tax cuts which have wreaked havoc on the state budget began to kick in, leading to a $675 million Certificate in FY 2015, and then the record $840 million in FY 2016. That means that at the lowest cash flow point of the fiscal year, likely sometime in March, the state’s general fund bills will total $840 million more than the revenue received up to that point to cover them. The general fund must repay the Certificate before the end of the fiscal year using revenues from April, May, and June that are hopefully much greater than the bills that need to be paid in those months. 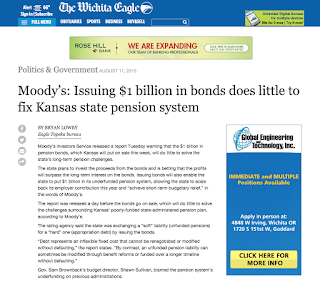 If Kansas were financially stable, it would have a large enough cash balance to avoid borrowing. What if April/May/June revenue does not come in as estimated? The Certificate still needs to be repaid, so in that scenario, program cuts would have to be applied to keep the general fund solvent. Everything must go perfectly in order to slide by with even this meager budget. But things usually don’t go perfectly. Unexpected costs appear, or revenue underperforms expectations. Recessions come as part of the business cycle. Kansas is not ready. Kansas has little flexibility, and is operating on the financial margins. Lawmakers cut the state revenue stream too deeply and used up cash reserves to eke through the last two fiscal years. —This entry originally appeared on the Kansas Center for Economic Growth website.